Looking for a map or guide book to help plan your next ski touring adventure? The Backcountry Skiing Canada store has a great selection of not just maps, guides and books, but also t-shirts, stickers, videos and patches. 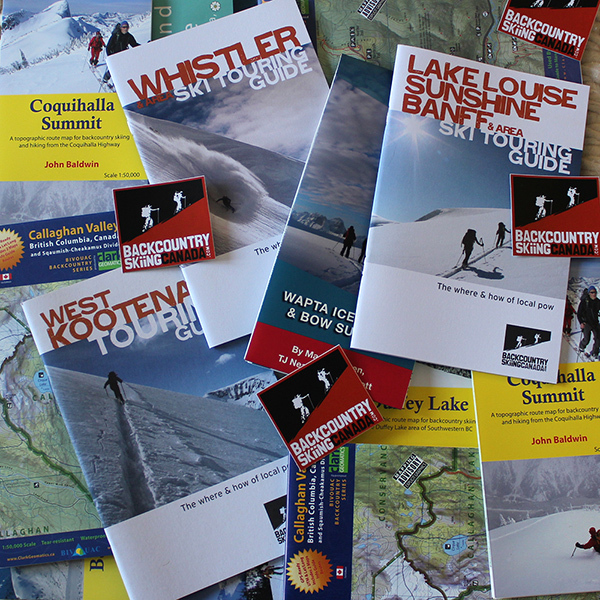 In addition to the Backcountry Skiing Canada West Kootenay Touring guide, Backcountry Skiing Canada Whistler & Area Ski Touring Guide and the Backcountry Skiing Canada Lake Louise, Sunshine, Banff & Area Ski Touring Guide we also carry 18 additional guides, books and maps to get you the knowledge you need. - Canadian orders will take approximately 1-2 weeks for delivery. - US orders can take 2-3 weeks due to customs and their volume of work. - Overseas orders can take from 4 - 8 weeks based on the destination as they are shipped via land and not air due to the prohibitive expense of that. Heavier weight orders outside of North America will ship by ground whereas smaller guides and single guide orders ship by air. Should your order be returned to us we will e-mail you to notify you, otherwise, it is on it's way to you and there is no way for us to track your order or let you know the status of it so be sure to order early to allow extra time for it to arrive. We do not issue refunds once orders have shipped out. Most orders arrive on time but there are exceptions and since the postal service is beyond our control we cannot take responsibility for any delays. Cancelled orders are subject to a $5/order restocking fee. Happy shopping and we hope you find the guides and maps useful. Read about all the features of the Backcountry Skiing Canada West Kootenay Ski Touring Guide 2.0 and get a sneak peek inside here. Read about all the features of the Backcountry Skiing Canada Whistler & Area Ski Touring Guide and get a sneak peek inside here. Read about all the features of the Backcountry Skiing Canada Lake Louise, Sunshine, Banff & Area Ski Touring Guide and get a sneak peek inside here. Read about all the features of the Whitewater Backcountry Ski Touring Map and get a closer look here. Read about all the features of the Kootenay Pass Backcountry Ski Touring Map and get a closer look here. Read about all the features of the "Side, Slack & Back, We've Got Your Country." Texas Orange T-shirt and get a closer look here. Read about all the features of the "Side, Slack & Back, We've Got Your Country." Black T-shirt and get a closer look here. 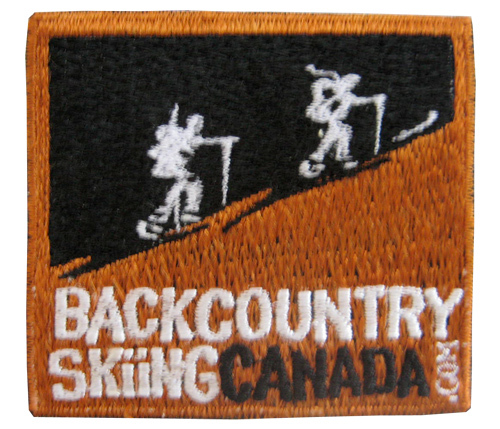 Read about all the features of the Backcountry Skiing Canada Patch and get a closer look here. Read about all the features of the Backcountry SKiing Canada Sticker and get a closer look here. Read about all the features of the Wapta Icefields and Bow Summit Map and get a sneak peek inside here. Read about all the features of The Icefields Parkway, Lake Louise to Bow Summit Guide Book and get a sneak peek inside here. Read about all the features of the Rogers Pass Uptracks, Bootpakcs & Bushwhacks Book and get a sneak peek inside here. Read about all the features of the Rogers Pass Uptracks, Bootpacks & Bushwhacks Map and get a sneak peek inside here. Read about all the features of the Rogers Pass and Glacier National Park & Area Map and get a sneak peek inside here. Read about all the features of the Garabaldi Park Map and get a sneak peek inside here. Read about all the features of the Callaghan Valley / Cheakamus Divide Map and get a closer look here. Read about all the features of the Manning Park Map and get a closer look here. Read about all the features of the Kokanee Glacier Provincial Park Map and get a closer look here. Read about all the features of the Rossland Range Backcountry Ski Touring Map and get a closer look here. Read about all the features of the Backcountry Skiing Duffy Lake map and get a sneak peek inside here. Read about all the features of the Backcountry Whistler Map and get a closer look here. Read about all the features of the Backcountry Skiing Coquihalla Summit Map and get a closer look here. Read about all the features of the Backcountry Shames Map and get a closer look here. Read about all the features of theExploring the Coast Mountains on Skis Book and get a closer look here. Read about all the features of theSummits & Icefields 1 Alpine Ski Tours in the Canadian Rockies Book and get a closer look here. Read about all the features of the Summits & Icefields 2 Alpine Ski Tours in the Columbia Mountains Book and get a closer look here. Read about all the features of the The Bozeman and Big Sky Backcountry Ski Guide and get a closer look here.